Just look at the picture above. Who could ask for anything sweeter than a Beauceron puppy? Before you grab the newspaper or get on the internet, it would be wise to take into account a few facts. I will give you a few things to consider, but don’t let this be your only source of information. Please visit my links page for web sites that have other information about the Beauceron. The little sweetheart you see above was about 6 months of age when this photo was taken. He is already pretty well behaved and was housebroken within a week from the time he went to his new home. The Beauceron is extremely smart and has a burning desire to be with his owners at all times. The puppy above is Black/Tan in color but they also come in a Grey/Black/Tan variety that we call a Harlequin (actually a merle). Hair is relatively short but that doesn’t mean they don’t shed. Beaucerons are what I would term a medium shedder. Twice a year they will shed more than at other times but I would certainly not say they shed heavily. However, they do shed all the time. Please note also that this 6 month old puppy has really large feet. They really stand out in a crowd. Of course, when this dog is fully grown those feet will not look large at all. They will be needed to support the 85 to 105 pound dog that you have selected. Beaucerons were developed to herd and act as guardians. Herding requires a dog that can think and react accordingly. They must be able to do the job by themselves, and yet, when directed must obey without hesitation. In order to fulfill these requirements the dog must be intelligent and loyal without question. While they are not herding your flock they must be by your side at all times. Now, if you don’t have a flock, guess where your dog will be. You quickly find that they are equally at home on your bed or sharing private moments in your bathroom. They are great at helping you prepare dinner, or if you made the mistake of feeding them under the table, helping you eat dinner. When you get your Beauceron, do yourself and the dog a favor and purchase a crate to keep him in. It really makes it easy to housebreak the dog and later in life will give you some private moments. All dogs evolved from wolves and they still retain many of the traits of wolves. All dog families have a hierarchy that the dogs know about. Unfortunately, many times the owners are not aware of this hierarchy and this usually ends up poorly. Dog families have a leader and everyone else is subordinate to that leader. There is also a second in command, a third, and so on. In families where the humans are the leaders you will normally have a well adjusted dog and few problems. We have all heard of the dog that is totally devoted to his master but urinates in other family members shoes or growls at them when they get too close at dinner time. This is a dog that knows who his leader is but thinks he is second in command and above everyone else. Then there is the dog that is the leader. He pulls on the leash, demands to be taken outside, does not mind anyone, and bites. This dog doesn’t just bite strangers, he will bite everyone. We have all seen this behavior in many different dogs. Usually, the behavior is tolerated by the owners in a small dog because it is too small to hurt anyone. These dogs are totally obnoxious and no fun to be around. Now as for the Beauceron, don’t forget this dog will weigh around 90 pounds. That type of behavior in a 90 pound dog is not only unacceptable, it’s dangerous. It doesn’t matter that you have had dogs all your life, everyone should attend a basic obedience class with their new dog. It will teach your dog some things but more importantly it will teach you how to handle your dog. Before I forget, not all obedience instructors are the same. Ask some questions about their training and experience. You don’t want an instructor that specializes in small submissive breeds. They should have some experience with large dominate dogs also. The Beauceron is naturally wary of strangers. They will watch strangers closely and be hesitant to approach without encouragement. Don’t mistake this for fear. Quite to the contrary, while the Beauceron will not be happy with a stranger in their space, they will not hesitate to take positive action if they or their family are threatened. These dogs make excellent police dogs because of their intelligence and willingness to wade into a fight. This means that they should be heavily socialized from birth. They need to be put into unusual circumstances as puppies to develop confidence and willingness to approach other people. Dogs that don’t get out to meet people many times end up without confidence and bite out of fear. 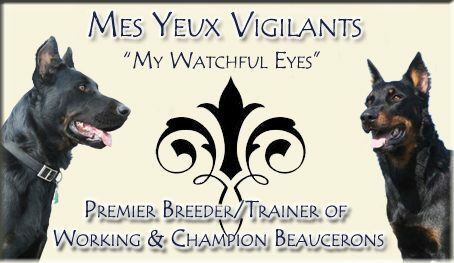 Beaucerons are generally healthy but do have some issues as do all breeds of dogs. Please look at our health page and do your homework so that you know what are the health issues of the breed. The breeder that you get your puppy from should have done the necessary screening of the parents. Ask for proof of the screening in the form of a certificate or an independent source like the internet. Ask about health issues in the pedigree that may not have a screening test. When you do this, you are at the mercy of the breeder so be careful. Ask for recommendations from previous puppy buyers. So, from whom should you get your dog. There are people that will tell you to only get your dog from France, that there are no good dogs in the United States. While it is true that the gene pool in the U.S. is small, it is equally true that all the dogs or their ancestors in the U.S. came from France. The price for a dog is higher here than in France because of supply and demand. However, if you want a cheaper dog from France, be prepared to pay for your trip to examine the kennels and transportation of the puppy. I can’t tell you how difficult it is to deal long distance. Generally, you will get a better dog if you purchase from a breeder that shows their dogs. They are interested in producing better looking and healthier dogs than are breeders that are only trying to make a profit. A show dog breeder normally will keep a dog they want to show and sell the rest that may have minor imperfections. This means high quality dogs available at reduced prices. Naturally, if you want a show dog, expect to pay more. Questions that I haven’t answered? Please write or call me directly. This entry was posted in Before You Buy on January 15, 2017 by myvbeauces.